By Alan Green in Tertiary Minerals (TYM) on 2nd July 2018 . Acidspar consumers in Europe have struggled to secure quality material consistently and in timely fashion because Chinese consumers are paying more than their European counterparts. Acidspar availability in Europe is tight because producers are looking to sell to consumers in China where they can achieve higher prices. 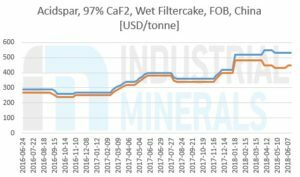 The tightness in the European market is forcing consumers to enter the Chinese market to source material, putting upward pressure on acid grade fluorspar prices in China. 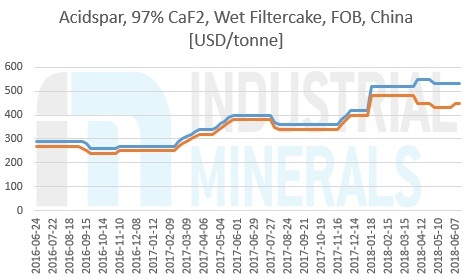 Industrial Minerals assessed the price of acidspar, 97% CaF2, wet filtercake, fob China at $450-530 per tonne on June 21, unchanged for a third consecutive week. At the start of 2018, the price was $400-420 per tonne. 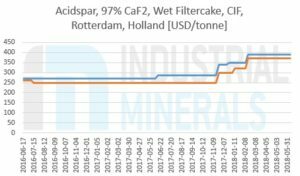 Industrial Minerals does not price acidspar sold into China on a cif basis but understands the price to be $450-500 per tonne, according to a source selling material to Chinese consumers. European prices have yet to react to the tightness and the choppier trading conditions, however. 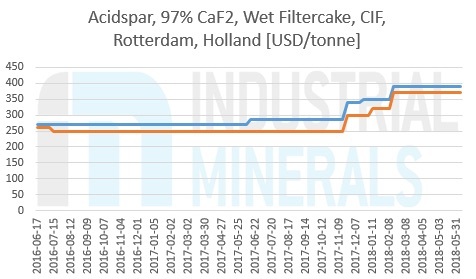 Industrial Minerals assessed the price in Europe for acidspar, 97% CaF2, wet filtercake, cif Rotterdam at $370-390 per tonne on February 15, where it has since held firm. “All the material available on the spot market has gone to China,” a second trader said. He claimed to have received inquiries from a major European acidspar user that had not previously approached him, highlighting the fact that even major buyers are scrambling to secure material. “Asia is paying better [than Europe] and any producer with material is supplying them,” a producer confirmed.